To build nuget package, you need to use the kpm build command, which will compile the project and build a nuget package based on frameworks key in the project.json. If you have both ASP.NET 5 CLR framework and cloud optimized CoreCLR framework included, kpm will build nuget package for both frameworks. 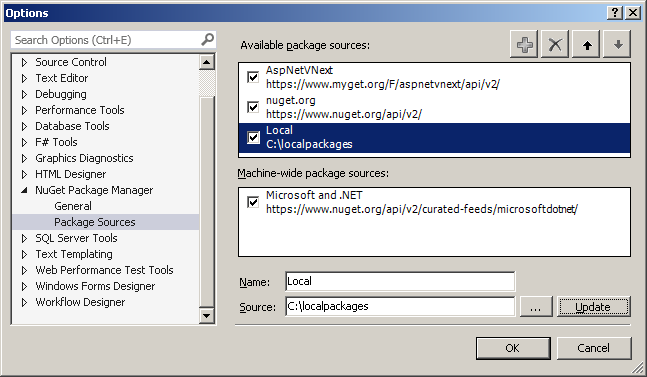 To deploy nuget packages locally, open Visual Studio. Select Package Manager Settings from Tools > NuGet Package Manager menu. It will display the Visual Studio options dialog. Select the Package Sources item. In the Window, click on + button. Now select the newly added item and modify the name and location, you can provide folder locations here. Note: You don’t need to create NuGet package while developing the application, you can do it with project.json file. If you keep the project.json file in the same directory level, runtime will pickup the class library automatically.